They chose someone else. You were passed over for promotion. You keep telling yourself there’s a silver lining. But your inner critic is going nuts and it feels like everyone in the office is looking at you. You loved your job yesterday. Today, after getting passed over for promotion, you’d like to walk in and quit. Don’t. One essential after being passed over for promotion is explore other options. Send out your resume. Why not? It’s up to date. Connect with headhunters. Explore opportunities, even if you weren’t planning to. Give yourself permission to fail. Put yourself in a position where you get passed over a few more times. Apply for your dream job in another organization. Take the reigns of your future. But be prepared, there’s more rejection out there. Getting passed over is part of life. You aren’t the best fit. People don’t fully appreciate how wonderful you are. Maybe there are internal politics. It doesn’t matter that you don’t like it. If you can’t risk getting passed over, you’ll end up stuck. You’ll play it safe. You’ll end up hating yourself. Send your resume out, but find reasons to stay at the same time. How much – on a scale from 1 to 10 – did you enjoy your job before you were passed over? If the number is low, why didn’t you choose a lower number? This question will help you look for positives when you feel dark. Ask, “What would have been true of me if I had been chosen?” Don’t obsess about what’s wrong with you. Focus on who you might become. 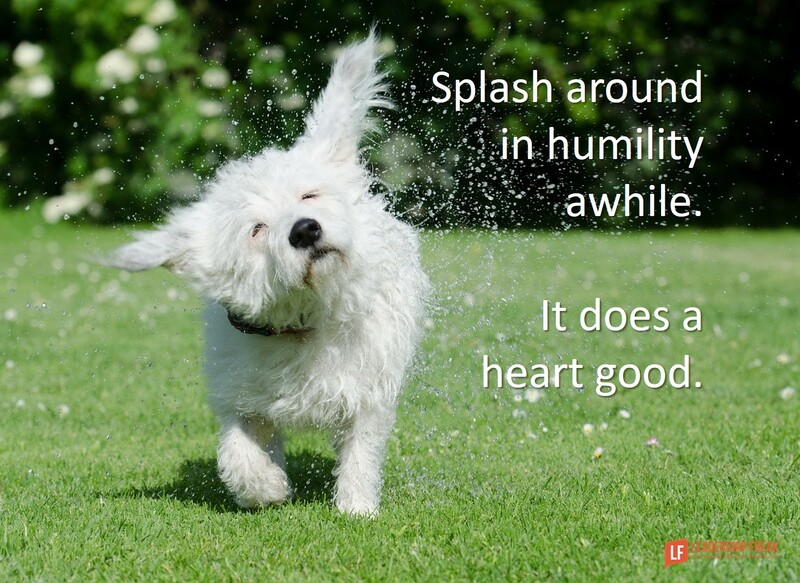 Splash around in humility awhile. It does a heart good. Tip: Here’s a general rule for success. Run toward, not from. Running from something often makes matters worse. What should leaders do when they are passed over for promotion? Afterword: This post is inspired by a reader who left a comment on yesterday’s post about being passed over for a promotion. Sometimes it feels like a punch to the gut. Thanks G. People are watching. Humility takes us further than arrogance and hurt feelings. However, it still hurts. Glad you stopped in. You have to swallow your pride to initiate the conversation, but you may uncover preceptions that exist about you in the company that you are not hearing about in your performance reviews. You also demonstrate a huge degree of maturity and character that can give you a leg up on the next job opportunity. Thanks vstern. Brilliant suggestion. You might include the term ‘earn’ in the conversation. We aren’t looking for any favors, just opportunities. Thanks for your insights. ‘Passed over promotion’ is a disturbing moment where you always try to see the negative elements working against you. At times, you are aware of these and you are mentally prepared for the other part keeping the hopes of the desired promotion. The best thing will be to accept the reality and go with an adjustment mode. One can wait for the next level of opportunity within the existing organization and continue doing the good work per assigned role. If things are really unfavorable then look for outside good options and leave the organization soon. You are the best judge and the right good decision can mould your better future! It’s better to be with a good progressive organization where you are valued and you can contribute well while advancing your career. Thanks Dr. Asher. Great insights. One of the best result of being passed over is learning to adapt. It still hurts. But we can get stuck in patterns that don’t serve us well. When that happens something that stings like getting passed over can help us break free and adapt. I couldn’t agree more that running from the problem will not make it any better. When I worked for this company for a long, I was really expecting to get a promotion. But it was given to someone who started working just a few years ago. It hurt me so much but I stayed. I found some reasons to stay- my friends and I really loved that job. This is a really great post that will inspire lots of people. Thanks Manjengwa. It’s great to read that you found reasons to stay that helped you get over the hump. Sometimes we forget that we loved the job in the first place. 80% of employees are not well suited to their jobs including supervisor, managers, executives, and CEOs. We keep hiring the wrong people to be our managers and above. Look for employers where job success is the norm not the exception. Thanks Bob. I feel like you’re pointing to company culture. If you get passed over in an organization that believes in promoting from within and is committed to develop people, staying makes more sense. If not, as you indicate, go find a place like that. I appreciate the issue involved in the post. It is deep rooted issue. Every one face some times of later but almost many prefer to keep silent. The reason- they know, nothing much can be done. Secondly, they feel, they have to remain in the system, so, why to be in bad books of key people. And I appreciate your point of taking risk. When people play safe or take middle path, they impede their path. They stand no where. I think, leaders should believe in leadership skills when they are passed over for promotion. They should introspect their potential and see where it can be explored better. Yes, I understand and agree that politics is part and parcel of the organisations, but it is even more important to take decisions. We block our path and become clueless despite having potentials when we bring our preference to remain in the same place. That is the point, we compromise and sideline our potentials. I think, decision is the most crucial part that many people do not exercise. Thanks Ajay. There is no advantage to sidelining our potential in order to get along or fit in. Decisions that give people the opportunity to maximize their strengths seem like the best. Those decisions could include staying or moving on. This approach keeps people focused on bigger issues. Don’t be so hard on yourself, there may be underlying reasons you were passed over, stay the course and keep doing what you do. If your that upset seek guidance from those who made the decision in a controlled manner. Perhaps your just not the shining star you think, find your weaknesses and better yourself through your senior advisory group if you have one. Always have a plan out, with a place to go before you quit if that is the course you chose. Thanks Tim. Love the compassion. Frankly, we perform better when we aren’t so critical. The idea of getting a better look at how we are perceived by others can be painful, but it’s beneficial. We just need understand our place, if the company passed you up it can be a factor that they like what your doing, at the same time we need to express our desires too, make it known your looking to move up the ladder. Just dont sulk if they pass you up! If you find that your position is not fulfilling for you, explore your options, you can still control your destiny, sometimes you need take risks. I love this post! Yes, I have put myself out there in my current place of work and others and have been “passed over.” It is hard for sure. It can turn your insides inside and out. But, I am an educator and talk about taking risks and resilience with my students and now with faculty. I am a big believer in walking the talk and I believe in lifelong learning. “Being passed over” can give the gift of humility if you let it. It gives us the ability to be more empathetic with others and is what I believe to be a gift from God. “Failure” is an opportunity to be reminded that I am not “all that” and there is always room to grow. I had the opportunity yesterday to listen to a wonderful leader, a Middle School Principal, talk about servant leadership. I believe being “passed over” can also help us be better servant leaders. The funny thing is, many people are drawn to leadership because they have strong, charismatic personalities, but great leaders realize that great leadership is not about how wonderful they are, but rather how great they can make the conditions of the people they serve. Thanks Heidi. Love the express “gift of humility.” It might not feel like a gift but the benefits of humble leadership far outweigh any advantages of arrogant leadership. Just think about the leaders who were humble or arrogant. Which were happier and more fulfilled. The down sides of arrogance include fear, jealousy, bitterness, and revenge. Yes, I think being humbled is a gift. You also wrote, “if you let it.” We need to remember that no one can humble us. We have to humble ourselves. “Maybe there are internal politics.” There are often two questions to ask if you get passed over; 1) Were you the best candidate? 2) Was someone else more qualified? After a promotion when one is not selected, one needs to do an assessment or an appraisal of his/her promotability to determine future courses of action. All too often, others are selected for reasons other than being more qualified. Why? Management prerogative, blatant incompetence on behalf of management, or perhaps some personal issues that need to be addressed on your behalf. When passed over, should you still desire that position eventually, you need to prepare accordingly. When passed over, and you believe you have been unfairly considered and the future looks dim, maybe you start the search for greener pastures. Good post, Dan. Thanks SGT. Yes…if anything, being passed over is opportunity to reflect. I think we might reflect more deeply after being passed over than before. I think we might be more open after, as well. The inclusion of the future is really helpful. How does the future look? As much as I hate saying it and it also saddens me very much, whether you get promoted or not, comes down, a great deal of the time to who you know, if your face fits and yes, internal politics. Sadly it is less and less likely down to what you know or what you may have done, achieved. 😦 I am a believer in Karma! Great post and yes, your blog is addictive as well as very informative. Have a great weekend! Thanks Thinker. If it’s true that promotions often come down to who you know, then we better start ‘knowing’ people. I don’t think we should brown-nose. But we can build relationships. Good relationships make life richer, even if we don’t get promoted. I think this might make it more difficult for introverts. But I can think of one introvert who became a networker and became the CEO of a multinational organization. Relationship building is great. Brown-nose – not nice to see. Networker – you are not a natural networker, don’t believe in networking or another way of putting it ‘a player’, why should this be viewed as an advantage for promotion selection? A ‘networker’ may not necessarily have knowledge & experience. Is there a right or wrong? When I wrote about the networking introvert, I was thinking of Doug Conant who became the CEO of Campbell’s Soup. When the opportunity came, he was able to go to his ‘network’ of friends for advice and support. Connecting with others is part of leadership. If you ask me, you can’t lead if you can’t connect with lots of different kinds of people. I realize that I shifted language from networking to connecting. I suppose there might be a negative aspect to networking. The brown nosing side. I’m not for that. But building relationships with lots of people is definitely better than being in the battle alone. I recall a former colleague, who had been working far above his grade, being passed over for promotion. He asked what he should have done. Our department head told him to not waste his time because he “wasn’t going to pay somebody more to do the same f*cking job”. Staff development and personnel management, much ? Great article. I am at the position in my career where I want to grow more. I can’t grow if I don’t push myself and take chances. Great read! I also wondered whether they would consider that they didn’t need to promote me since I was happy to still work so hard for 3 years after being denied. Anyway, love your posts! Thanks R. I respect that you shared your story. You some interesting questions, not the lease of which is about standing up for ourselves. Disrespect drains our vitality and passion. Some might say that it shouldn’t matter what others think, say, or do. But it does. Leaders would serve themselves and others better if they reflected on the power of showing respect. Titles and position aren’t everything. But they do matter. I really don’t like the expression “passed over”… it sounds way more personal than it should and I think leads to feelings that someone has done something to you rather than made a business decision based on the available information. In my old recruitment days I used to advise people that they “were unsuccessful on this occasion” and invite them to discuss the outcome if they wanted. Some did. Some didn’t. Those that did were given pointers by me about what would enhance their chances for promotion in future. I’ve recently had an interview for the next level position in my current organisation. Will I be successful? I hope so, but if not, I’ll waste no time trying to measure myself against the successful candidate, I’ll be knocking on the decision makers door to find out where I need to improve to be successful next time!! I have been given two valuable pieces of advice about getting promoted. First, treat each day like you are interviewing for your next position. Second, in the interview, discuss how you are ready to do that new job, not how well you are able to do your current job. If you were not selected for a promotion, look at the vibe you’ve been giving off at work (and not just after the opening was announced). Then, think about whether you made the best case of how you could draw on your experience to date to handle the new position. I’ve not been selected for promotion and I understand how awful it feels. Eventually I did get promoted and now I do hiring. I agree that how you act after the non-selection is very important. When we look at candidates for a position, we not only consider the education and job experience, we also look at how people behave in the workplace. How does the person interact with others? What is the person’s attitude when given a new or difficult assignment. I live by the motto that everyday I come to work I’m applying for my next job. People are watching and they remember. Thank you Dan for the article and to everyone for the great advice. It’s just happened to me so I’m currently trying to get past it. But I will, and I’m already finding it’s teaching me a lot about myself and hopefully about humility.